Located at Wirrimanu (Balgo Hills) on the northern edge of the Tanami and Great Sandy Deserts is one of the most diverse and innovative indigenous art centres in Australia. Warlayirti Artists, the art centre cooperative, promotes the rich and evolving work of the talented artists who live in this remote community. 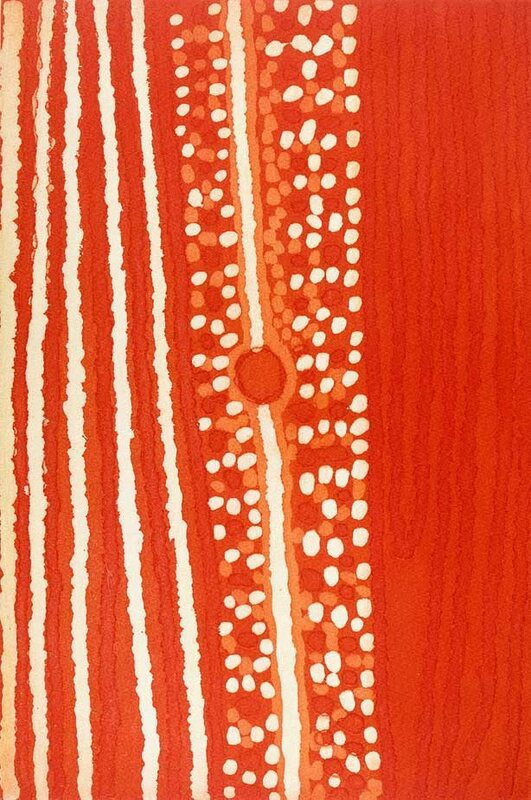 Warlayirti Artists is new to printmaking. The remote location has meant little access to the facilities required for prints, despite the success with works on canvas. During the printmaking workshop at Northern Editions, Northern Territory University in 1999, Helicopter, together with Tjumpo Tjapanangka, Sam Tjampitjin, Billy Thomas, Eubena Nampitjin and Lucy Yukenbarri all made etchings and screenprints, while most of the artists also painted on ceramic bowl forms, under the supervision of Rose and Angus Cameron. The artists had previously been exposed to the possibilities of printmaking at Balgo by Franck Gohier and George Watts. Born at Ninmi, Helicopter learnt from a young age the location of water sources and how to hunt for bush food. Helicopter is a 'maparn' and people travel hundreds of miles to see him for healing. He is also a respected painter alongside his wife Lucy Yukenbarri. In the early 1990s he painted with his wife, not seeking any acknowledgement. Since 1994 Helicopter has been painting on his own in a distinctive linear style that emanates around the central feature of a soakwater. He remains dedicated to painting his country and the country of his mother and father where he lived a nomadic life as a young boy. Signed l.r. beneath platemark, pencil "Helicopter" [in another hand]. Signed l.r. beneath platemark, blue ink "[artist's thumbprint]".